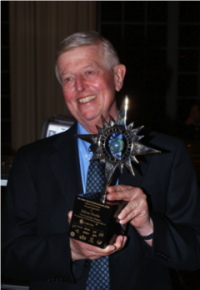 In April of 2012, CCSDS presented Adrian Hooke with a special award to recognize his lifelong leadership in CCSDS. It was presented at a dinner during the Technical Plenary meeting in Darmstadt, Germany. Rob Ritter, a longtime CCSDS expert and part-time performer, has created a tribute song in honor of Adrian Hooke, titled “I Am The Very Model Of A Modern Rocket Scientist” performed to the tune of the “Pirates of Penzance” song, “I Am The Very Model Of A Modern Major-General”. In the YouTube link above, he performed it at the European Test and Telemetry Conference, in June 2013. Adrian Hooke dedicated his career to advancing the abilities of our international space agencies to work together, through development of data/communications technology and standards that enable multinational missions and bring many other benefits to the aerospace industry. He is credited with initiating the coordination that would eventually bring CCSDS into existence, and with providing not only technical and management leadership, but also the conscience, heart and soul of CCSDS for the three decades of his CCSDS participation. From 1966-1969 Adrian worked in US industry as a member of the Kennedy Space Center launch team for the Apollo 9, 10, 11 and 12 Lunar Modules. Joining JPL in 1969, he was a member of the flight control teams for the Mariner 9 and 10 missions to Mars, Venus and Mercury. He worked on the Voyager onboard data system and led the design of the SEASAT end-to-end data system. In 1976, he took a position with the European Space Agency working on the flight operations architecture for ESA’s role in the Shuttle-SpaceLab program. Rejoining JPL in 1977, he focused on the development of new technology in the area of standardized space data communications protocols. During this early period, Adrian worked on the development new approaches for space data communications. In 1974, he co-authored a new technology study on “Block Telemetry”, which actually flew on a later mission. With Adrian’s help, this work was expanded within NASA in 1977 to a JPL/GSFC collaboration, the NASA End to End Data System (NEEDS). Then, in 1979, Adrian used contacts from his time in the European Space Agency (ESA) to evolve NEEDS to an international collaboration; the NASA/ESA Working Group (NEWG). The NEWG would pioneer international usage of the “Packet Telemetry” scheme, the foundational telemetry scheme that would later become the bread-and-butter of the Consultative Committee for Space Data Systems (CCSDS). By 1982, Adrian and NASA HQ had expanded the NEWG to include other agencies, and the CCSDS was officially formed. Over the next 30 years, Adrian would perform a multitude of CCSDS leadership roles both in the highly technical and management arenas. Adrian served as the “technical conscience” of CCSDS, working towards the interests of both NASA and the whole international community, and forging a groundbreaking path for multi-agency spaceflight missions. Adrian also brokered the agreement between the International Standards Organization (ISO) and CCSDS which would put CCSDS standards on a “fast track” to become ISO standards, by designating the CCSDS organization as ISO Technical Committee 20 Subcommittee 13 “Space Data and Information Transfer Systems”. Adrian also chaired the US Technical Advisory Group 13 (USTAG13) which formulates the US inputs into ISO TC20/SC13. On the technical side, Adrian was instrumental in developing the Space Communications Protocol Specifications (SCPS), which were precursors to the advanced Delay Tolerant Networking (DTN) protocols. He also provided a major technical leadership and Project Management roles for both DTN and Data Standards within NASA. At the peak of his leadership, Adrian served as the chairman of the CCSDS Engineering Steering Group (CESG) and as the NASA Project Lead and Technical Lead for the Data Standards project and DTN project in the Space Communications and Navigation office at NASA Headquarters. Managing CCSDS overall, Adrian executed innumerable innovative management strategies, such as reorganizing CCSDS (in 2000), modeling it after the successful Internet Engineering Task Force (IETF) processes. His technical vision and leadership drove the standards community as he executed and relentlessly promoted the adoption of standards by the international community. As of this writing, the adoption of CCSDS standards by over 600 missions, both US and international, is a testament to the broad influence that Adrian’s work has had on humankind’s spaceflight programs. Adrian’s leadership, vision, wit and wisdom was a principal driver for the first three decades of CCSDS accomplishments. Adrian will be sorely missed by his NASA and international friends and colleagues. Adrian held a B.Sc. (Honours) in Electronic and Electrical Engineering from the University of Birmingham, England. He was registered as a Chartered Engineer (C.Eng.) with the IEE in London and as a European Engineer (Eur. Ing.) with FEANI in Paris. He was awarded two NASA Exceptional Service Medals and the NASA Exceptional Achievement Medal. 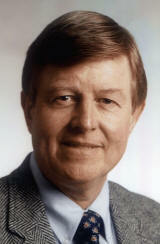 He was also awarded a one-of-a-kind special CCSDS award for his lifetime leadership, in April 2012.